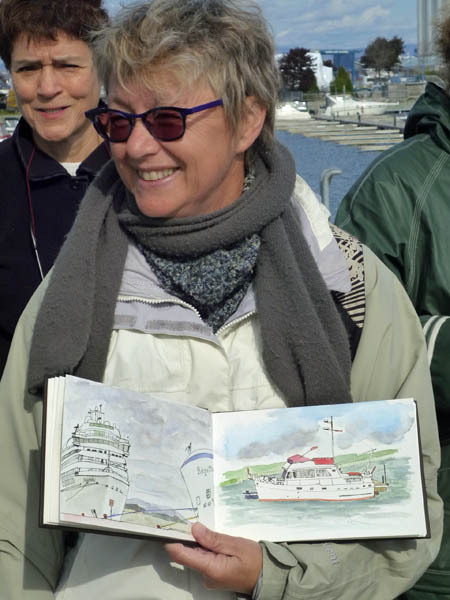 The change of seasons, for me, means transition from street sketcher to museum sketcher. It’s a sad time, but also an exciting time. There’s so much shape variation in museum exhibitions. Our Musee de la civilisation has a new exhibit just opened that presents Australian/New Zealand aboriginal art and as I play didjeridu and love aboriginal art, I’m quite excited about it. Most of the exhibit is paintings, rugs, and such but there are some statues and masks that I’ll be taking advantage of this winter. I was there a few days ago, drawing a large wall-hanging mask. So were a bunch of kids on school outings. The kids were great as they’d come to see what I was doing and when I talked to them I got half a dozen more coming to see what was going on. This begat more and more kids to the point where I was mostly just talking to them about the watercolor pencils, waterbrushes, and how much fun it is to draw. Kids “get it.” They haven’t learned the feelings and emotions about art that adults somehow acquire. 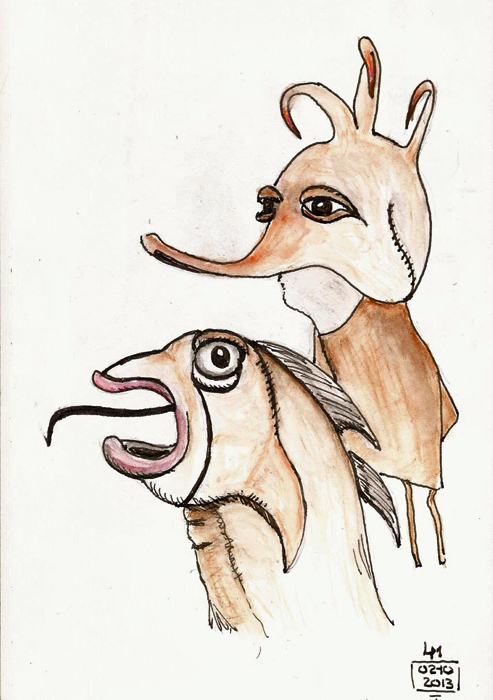 Eventually they wandered away, though, and I got back to drawing. I was really enjoying the music and serenity of the room. A mother and her two young daughters (I’d guess they were 4 and 6) came by and, again, the kids were interested and, as is often the case with parents, the mother told them to leave me alone. I told her it was fine and I showed them what I was doing. The older girl had some sort of writing/sketching book with her and started to draw with me. The younger one, of course, wanted to draw too, which sent mom scrambling for paper and pencil. She found some paper but had only a Seattle Seahawks pencil with her and it needed sharpening. I sharpened it and we chatted as I did. They were on vacation from where some of my favorite urban sketchers live – Seattle. The kids drew a bit and I finished my sketch. The older girl came over to show me her drawing and I asked her if she wanted to use my watercolor pencils to color her drawing. Her look was priceless and I loaned her one pencil at a time. The same thing happened with the younger girl. We had a regular sketchcrawl going on. I wish I had been smart enough to take some photos. 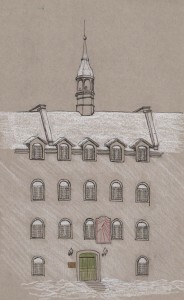 Sadly, all I can share is the sketch I did, but it was the most insignificant thing that happened on this day. Snow has started to melt but it’s still piled high, so Athos, Porthos, and Aramis (the Three Musketeers) decided to meet and draw indoors at Celine’s house. She has a studio full of plaster casts that provide fodder for sketching fanatics. They invited me, d’Artagnan, along as the token anglophone of the group. 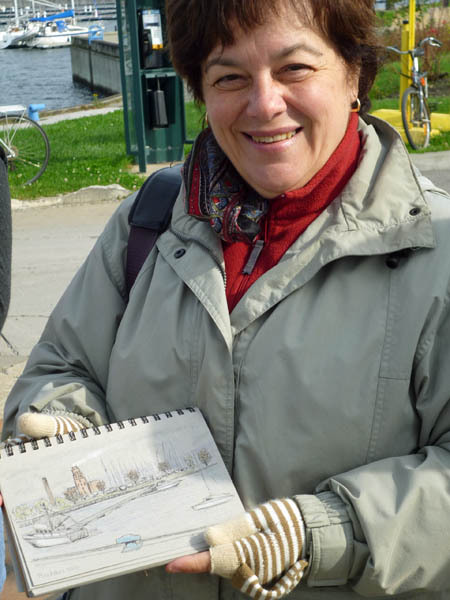 We had a great time sketching, looking at art books and talking about our upcoming road trip to Ottawa’s National Gallery. More on that later. I sketched a couple smaller, painted plaster figurines in a Stillman & Birn sketchbook using a Pilot Prera and Lexington Gray ink. Faber-Castell Albrecht-Durer watercolor pencils were used to add a hint of color. I love these pencils more everytime I use them as you can completely eliminate the lines made by the pencil. 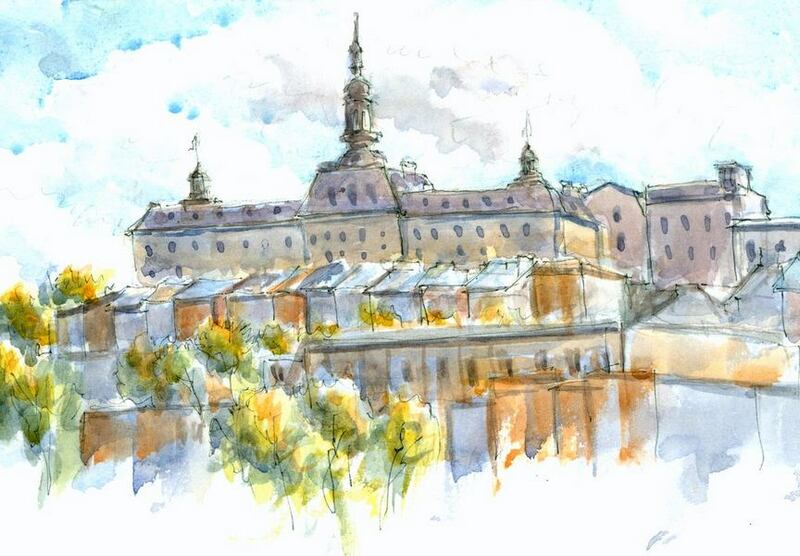 It’s not location sketching but it’s sure good practice and goodness knows I need that. I have to confess up front that I’m not a pencil guy. I might even want to be but I enjoy pushing pens across paper so much that it’s hard for me to use anything else. And so I carry a single 0.5mm mechanical pencil with 2H or 3H lead that I use to quickly block in a subject before I start drawing it. As I said…I’m not a pencil guy. So it’s odd for me to be talking about a pencil but Faber-Castell’s Perfect Pencil snapped my head around when I heard about it and double-snapped it when I found one in an Ottawa art supply store last weekend. It’s just plain cool, even if it is a pencil. I also have to confess that I love wooden pencils. They just feel good in my hand. I also like that you can use the side of them, use them dull, or sharpen them up for fine details. 1) You have to sharpen them and the tiny portable pencil sharpeners produce a short, stubby tip. Yes, I can use my pen knife, which is very Bohemian, but also rather impractical when sitting in a music recital or riding a bus. 2) The tips break unless protected. Yes, I can keep them in a case but then they’re not available. A lot of my sketching is ‘grab the book and draw’ sorts of sketching. 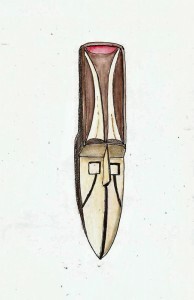 3) The length becomes a problem as the pencil is used. 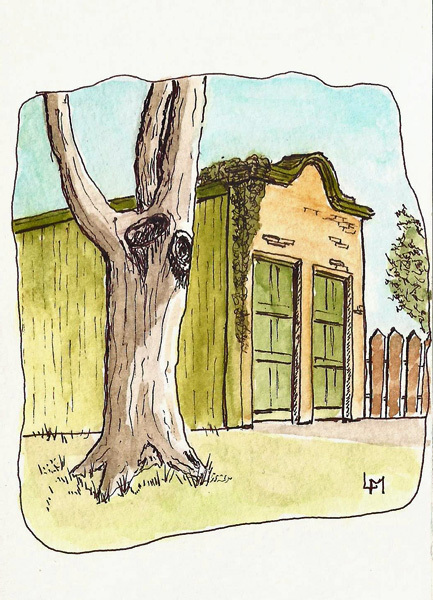 And yes, I could buy an extender. Something else to carry. What makes the Perfect Pencil so perfect is that it solves all THREE of these problems. The Perfect Pencil comes with a sharpener, and not just any sharpener. It’s a sharpener that produces a nice, long and sharp tip. The Perfect Pencil has a cover for the pencil tip, a cover that has a clip just like my fountain pens so it’s easy to carry. 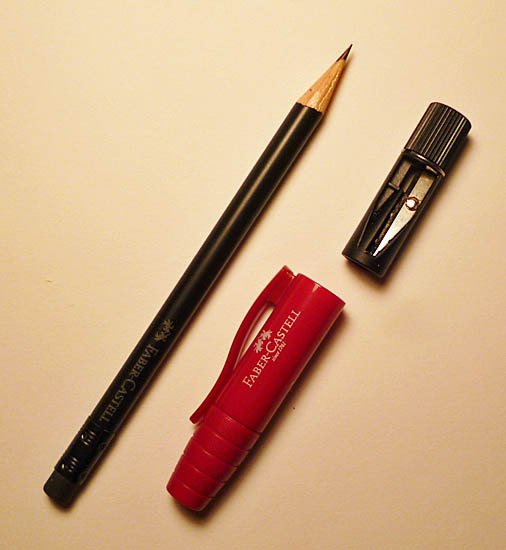 And when the pencil becomes short, you can stick its rear end into the cap, which acts as an extender. Best of all, you get all this for the price of one of those high-priced coffees where you get to feel empowered while making all those mind-bending choices. I can’t say much about the pencil that comes with the Perfect Pencil. It seems like a Faber-Castell HB pencil but it’s round rather than hexagonal. That said, you can replace it with any standard-size pencil. I’ve tried other Faber-Castell pencils (including watercolor pencils), Staedtler pencils, and Blackwing 602s. The 602s defeat the extender function because of their square eraser but otherwise they work fine. I might become a pencil guy yet. In any case, I’ll be carrying my Perfect Pencil when you see me on the street. 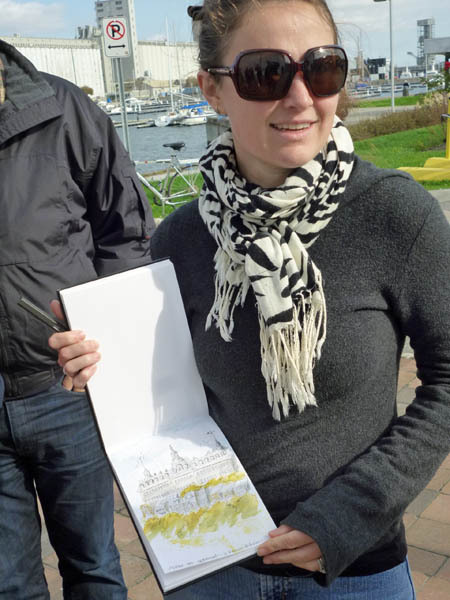 This is the second year that we’ve done the October worldwide sketchcrawl. It’s a challenge for us because, by this time of year, it’s generally pretty darn cold. Last year I learned a new French word – frissoner – which means to shiver. 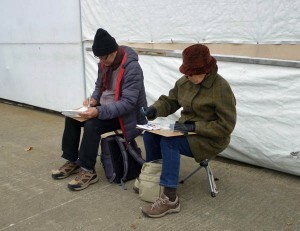 So, only the intrepid among us are up for outdoor sketching in October. which is something I’ve never managed to do. We made up for a lack of temperature with an abundance of laughter, talking, and sketching. It was a great day and by my count, we had 14-15 people in attendance. 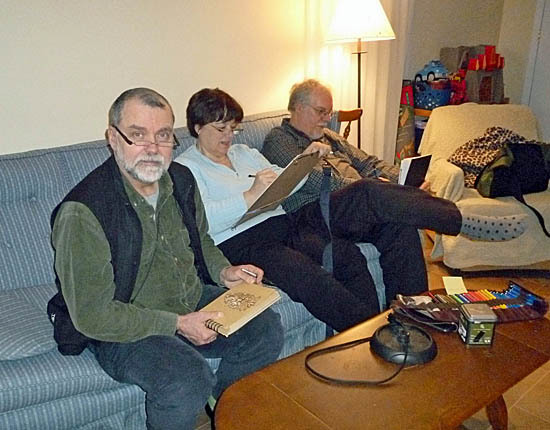 I remember, during the planning of our first sketchcrawl (June 2012), we wondered whether anyone would show up at all. We’ve come a long way. 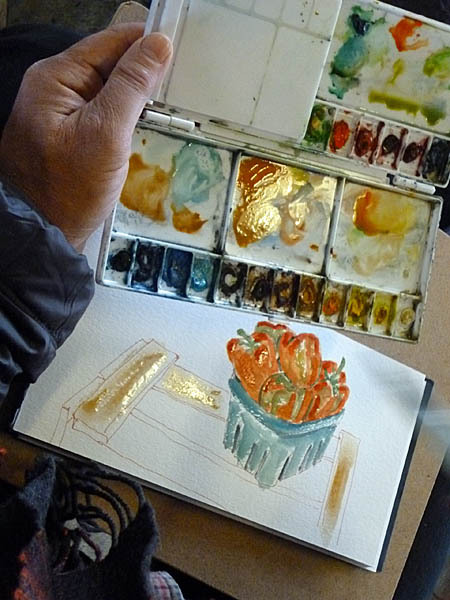 I did get to do some sketching and had great fun doing it but the most fun was talking with several of the newcomers to our ranks who were interested in my use of watercolor pencils (Faber-Castell Albrecht-Durer) and wondered what sketchbooks I used (Stillman & Birn). 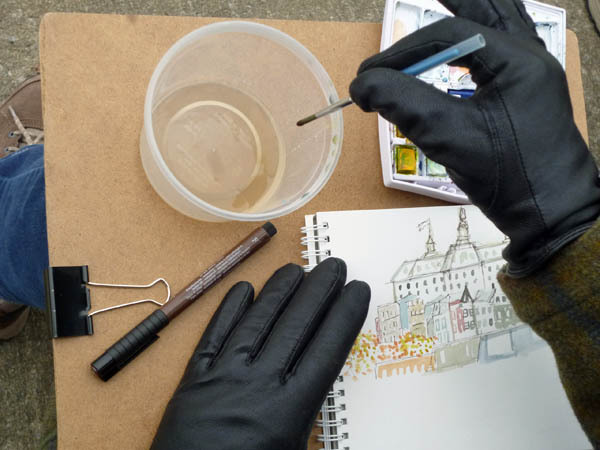 We chatted about sketching in general, about having sketchcrawls more regularly, where to sketch during the Quebec winter, and a lot of other things. This was a sharp contrast to my more typical loner stalking of sketching subjects in Quebec City. 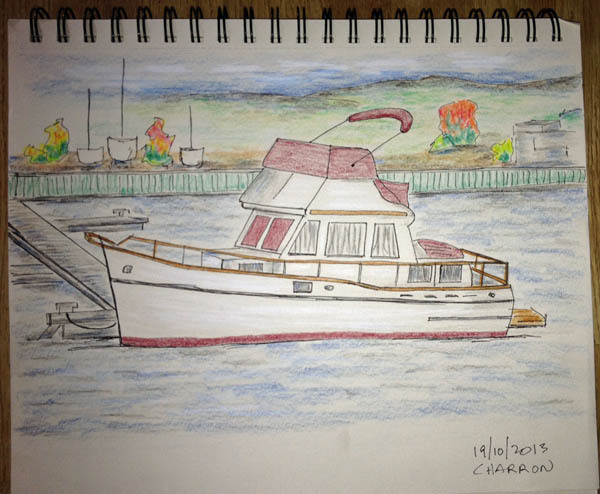 Gilles Charron was one of the guys at his first sketchcrawl. 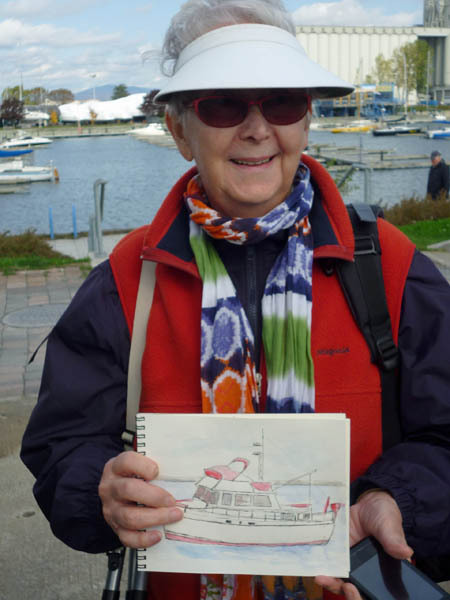 He’s been a watercolorist for a while and lamented that he should have been drawing more. He made up for lost time, though, doing these two sketches during the event. Aren’t they great? Yvan Breton and Celine Poulin organized the event and a big thank you is launched in their direction. I don’t have a photo of Yvan at this event but his art speaks volumes about his talent. 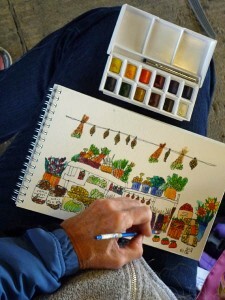 I do have a photo of both Celine and her artistic talent. and some of the sketches they did during our sketchcrawl. 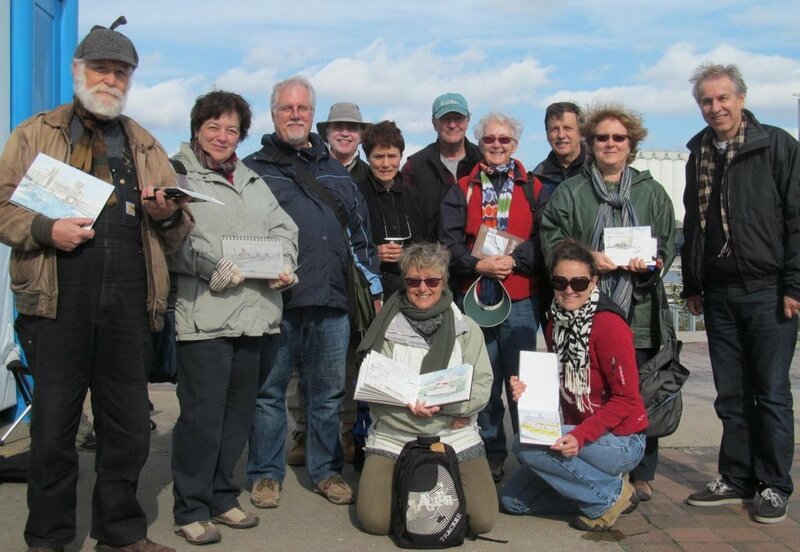 Thanks to all the participants; you made the day very special. 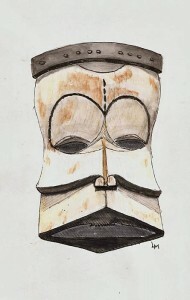 Some of the Nigerian masks are coated with a kaolin clay, making them very white. In places the clay has worn off and so some of the wood shows through, giving the masks an interesting texture/coloring. I was only semi-successful in capturing that look in this mask. Stillman & Birn Epsilon sketchbook, Pilot Prera and Lamy Safari, both filled with Noodler’s Lexington Gray. 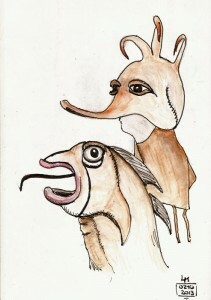 Brown and black watercolor pencils provided some color but I really needed a cream pencil for this one. 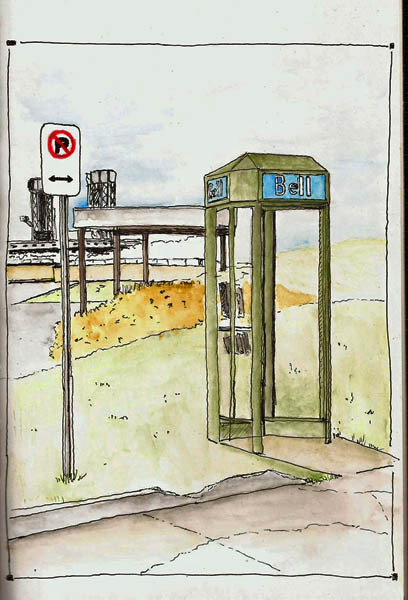 Last summer was my first as a location sketcher – actually it was my first summer as any kind of sketcher. I fell in love with the process and excitement of being out on the street, soaking up the sun and ambiance while sketching. Quickly the early fears I had about people talking to me became one of the joys of the sketching experience. And so I faced winter somewhat depressed as it becomes too cold for man nor beast to be on the streets of Quebec and I thought I’d have to do my sketching at home, in my office. 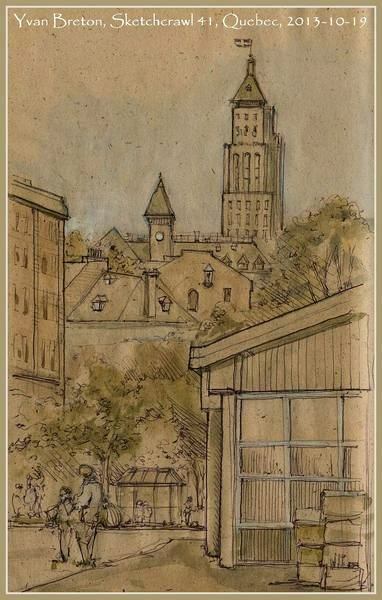 That has never interested me much, but then a couple fellow sketchers said, “We sometimes sketch at the museum – want to come?” and my world changed overnight. I got a permit to sketch at the art museum. I became a member of our Musee de la Civilisation, which also gave me access three other, smaller museums. And I’ve met new people, had new challenges, experimented with new materials and learned a lot about seeing complex objects while drawing same with minimal equipment. I’m sketching as much this winter as I did during summer. 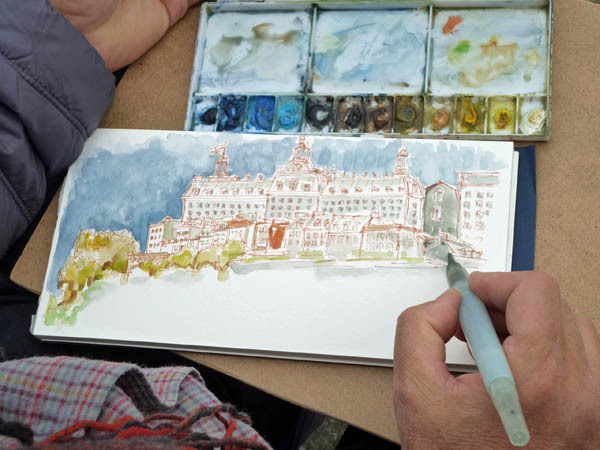 The subjects have changed, but I feed my desire to sketch real things, in real time, without having to resort to drawing my spatula and coffee cup (grin). If that weren’t enough, Yvan Breton has become a good friend who is an architect and long-time artist. He’s become both a companion when I sketch and my mentor. His style and mine are quite different but he’s taught me more in the past couple months than I learned in my entire first year of sketching. I confess that all the information he’s provided has my poor old brain scattered and flailing to keep up with all the ‘gotta try that…’ feelings I’m having right now but hey, that’s part of the fun. 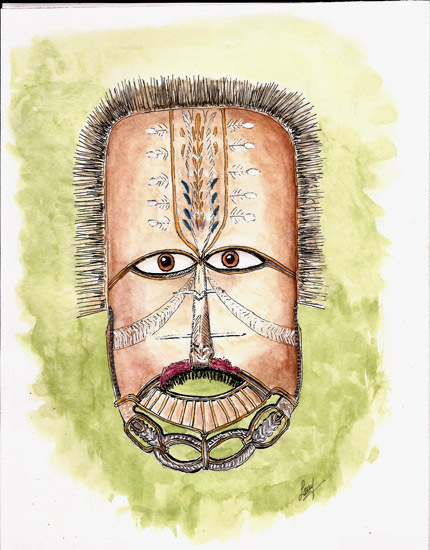 Nigerian mask, done in Stillman & Birn Alpha (5.5×8.5) sketchbooks, Pilot Prera/Noodler’s Lex Gray. 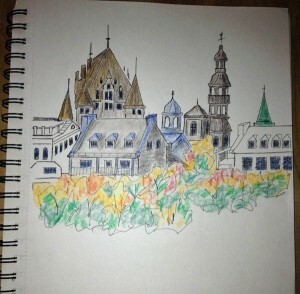 Partially sketched while Yvan was sketching me. The sketch above is of me, by Yvan. 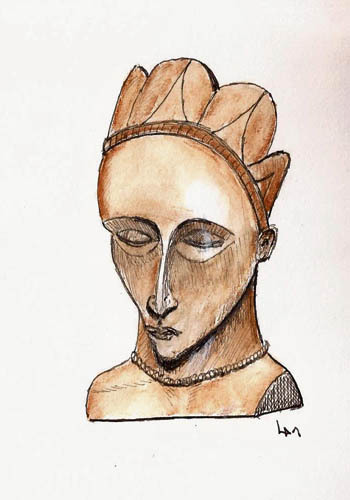 He did this “quick sketch” while I was sketching in the Nigeria exhibit at the museum last Tuesday. It’s one of my prized possessions. I’ll complete this post by showing you several of the sketches I’ve had opportunity to do in the last week. 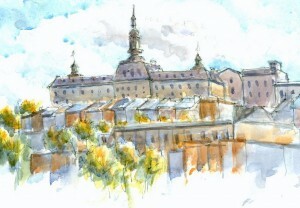 I think you’ll agree that the variety is far greater than my summer sketches, which are mostly buildings – my first love. While we’ve sketched some of the Nigerian exhibit already, we’re starting to spend more time there because the Samurai exhibit is leaving on Sunday. The funny thing about the Nigerian exhibit is that it’s full of great items to sketch but, it seems, they don’t become ‘great’ until you actually start looking at them as a sketching subject. 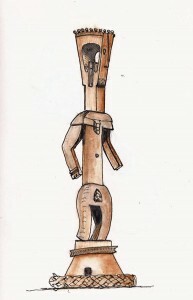 One is deceived by a walk-around in the exhibit and you conclude the items are a bunch of very similar, primitive sculptures. Primitive yes, similar, not so much. So many shapes, so many surfaces. Wow! 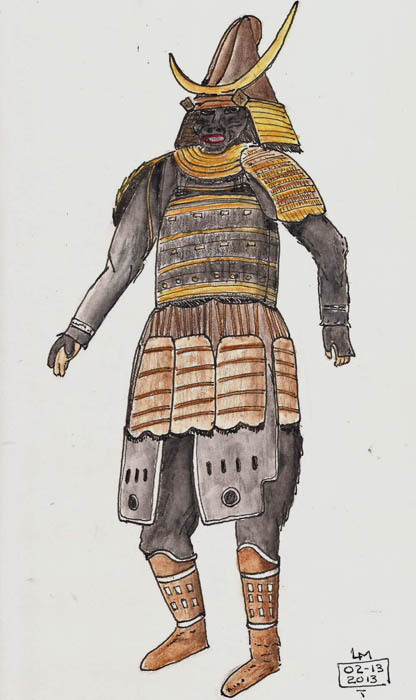 We spent last Sunday at the Musee de Amerique Francais, where I sketched Genghis Khan, or at least a mannequin wearing the Genghis Khan suit used in the movie Night at the Museum. 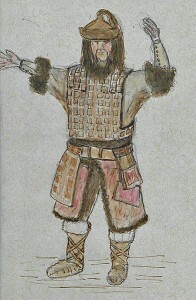 This was done in a Strathmore 400 “gray” sketchbook using Noodler’s Brown in a Pilot Prera. Lots of fun, though all those squares drove me nuts. When I was done, I turned my attention to some large paper mache heads used by the Cirque de Soleil in their show. These were ‘I gotta draw those’ subjects but I approached them with some trepidation. In the end they were lots of fun. 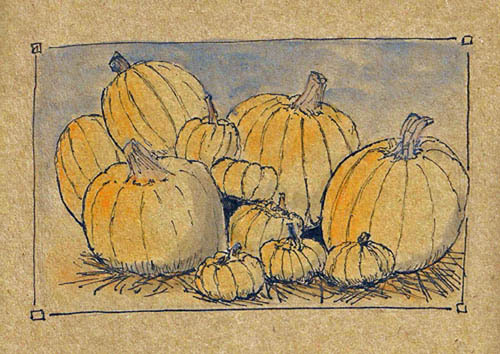 Stillman & Birn Epsilon sketchbook, Pilot Prera/Lexington Gray and Faber-Castell watercolor pencils for this one. I’ll conclude by sharing my full Samurai suit sketch. I’d promised myself that I’d do one before the exhibit left… just as soon as my skills began to match the amazing subjects. 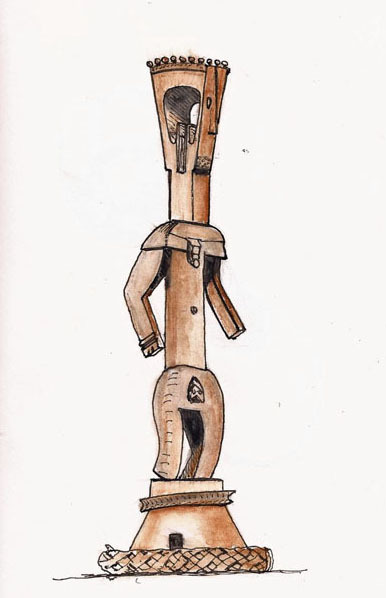 I didn’t quite make it on the skills end but, before the exhibit leaves on Sunday, I did sketch this one. I apologize for the absolutely weird positioning of the mannequin. That’s not me distorting it; that’s how they had it positioned. All of them were somewhat unnatural in their orientations in my opinion. 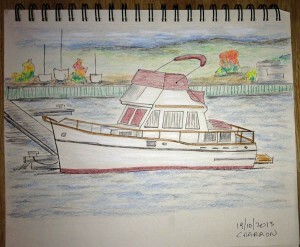 This one done in my Stillman & Birn Epsilon sketchbook, Pilot Prera, Faber-Castell watercolor pencils. 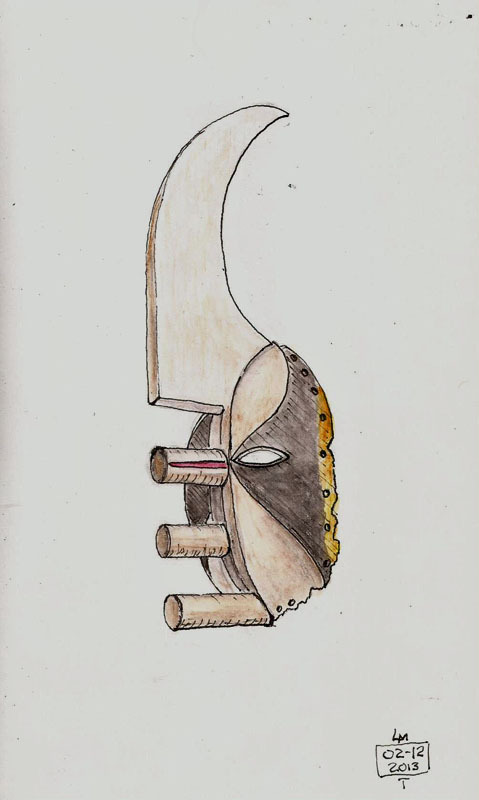 If you scroll back through the blog you’ll find lots of Samurai helmets, sketches of Joe Fafard sculptures, other Nigerian masks, and other stuff. Museum sketching is really fun. If you haven’t already, give it a try. If you have any questions, feel free to contact me. 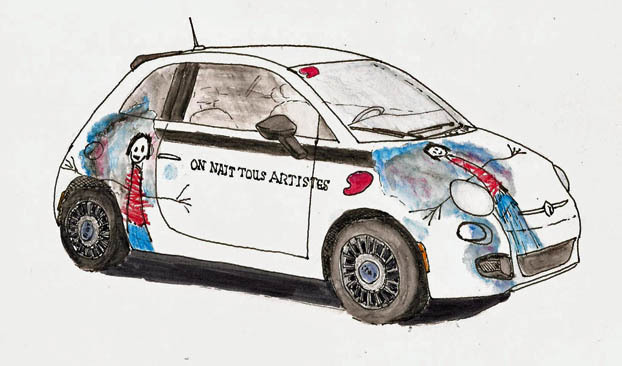 On nait tous artistes (We are all born as artists) is what is written on the sides of a tiny Fiat car owned by DeSerres, our local art store. They have just opened a new store within walking distance of my house which was event enough but in the parking lot was this really amazing Fiat, it’s paint scheme that of a young child drawing herself I suppose. Anyways, I just had to sketch it but it was far too cold to sit in the parking lot to do so. I took a couple photos, came home and sketched it off my computer monitor. 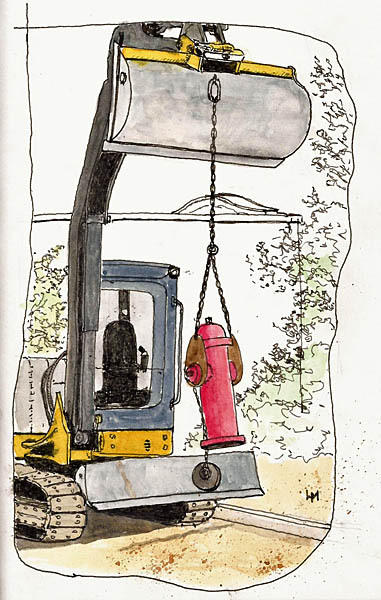 I guess that disqualifies it as a true ‘urban sketchers’ sketch but this one deserves an exception. Stillman & Birn Epsilon (5.5×8.5), Lamy Safari, Noodler’s Lexington Gray. 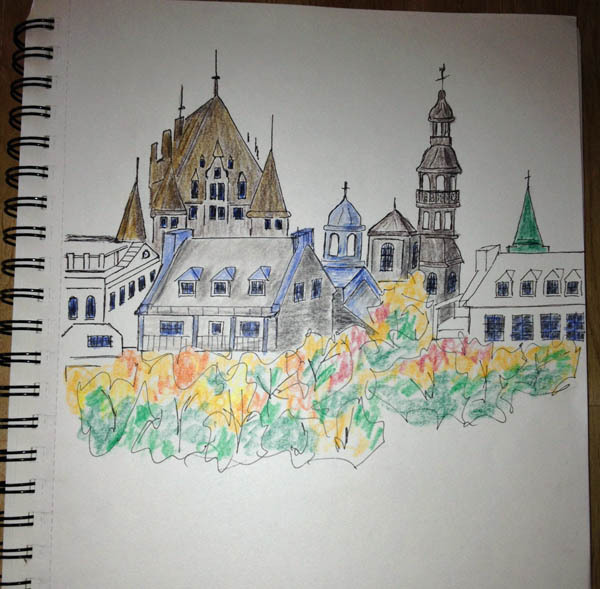 Faber-Castell watercolor pencils provide color. 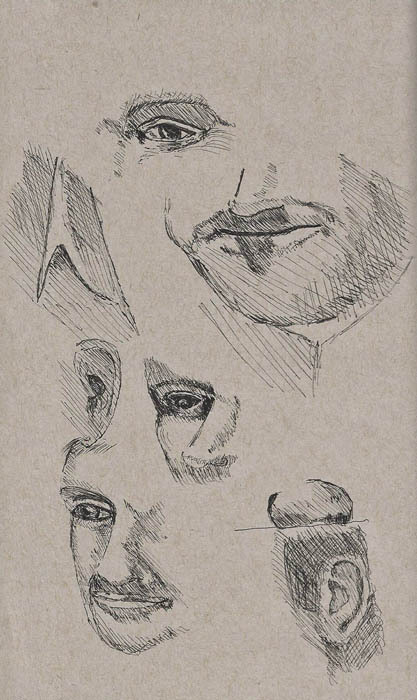 I’ve posted a couple examples of sketches I’ve done on Strathmore’s Series 400 gray drawing paper and it’s spawned a couple of questions about the sketchbook in particular but also the paper itself. I’m really new to the paper and I’m not a paper guru, but I thought it might be useful for me to discuss my limited experience with these products. 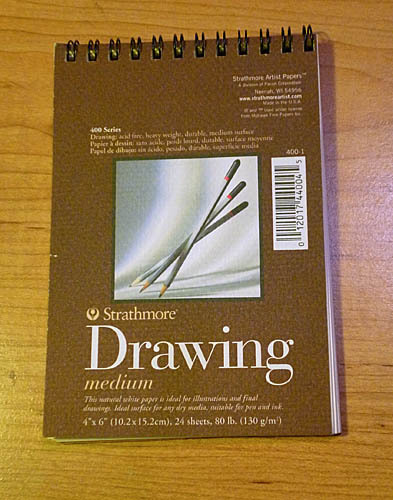 Strathmore’s Series 400 Drawing sketchbooks have been around for a very long time and most commonly found in various sizes of spiral-bound books with “Drawing” on the cover. According to Strathmore they are and “ideal surface for any dry media, suitable for pen and ink.” I’m not a pastel guy but I don’t think this paper would be useful for that medium but for pencil and pen and ink, it’s an excellent, inexpensive paper. 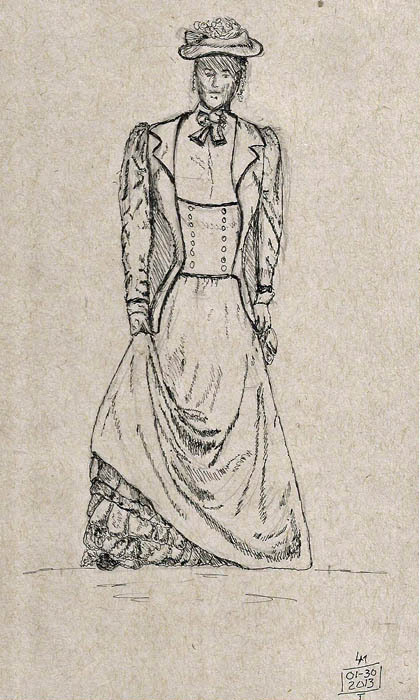 It may lack a bit in ‘tooth’ for those wanting to do detailed pencil sketches. 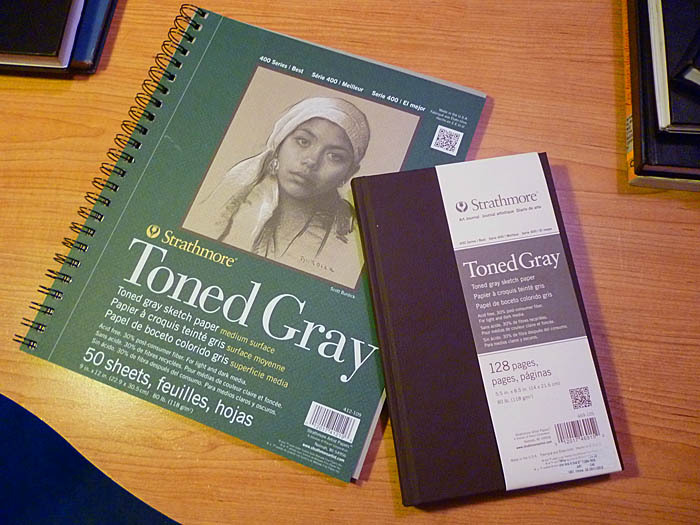 The recent release of this type of paper in both gray and brown is an important event in the sketching world, I think, and even more so because Strathmore has wisely produced brown-covered sketchbooks containing these papers. I nearly went off the rails the first time I saw one of these beautiful sketchbooks. 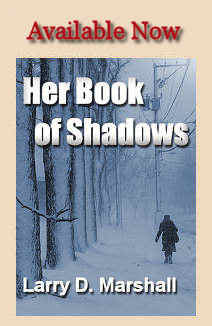 I get bored by the typical black covers and the matt-brown finish of these sketchbook covers speaks to me. The binding looks good but I don’t have enough experience with it to speak further about it. I should also add that I have no experience with the brown paper version so my comments are limited to the gray paper. But I’m getting ahead of myself as I first discovered this paper in a spiral-bound 9×12 sketchbook. These come with finely perforated pages so you can remove the papers cleanly. I did exactly that and use this paper as individual sheets. I found it very nice for pencil sketching, though I admit to know almost nothing about pencil sketching. 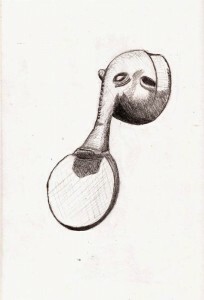 What I can tell you is that my buddy Yvan is a long-time and certainly excellent pencil driver and he said that “it’s great for ‘sketching’ (in quotes because his sketches are framing quality) but for portrait work the paper lacks tooth.” Those of you who understand this can do your own interpretation. Me, I’m still trying to figure out how to do basic shading with pencils. I’m a pen and ink guy and so I provide the ink sketch on the left, done with Noodler’s Lexington Gray ink. 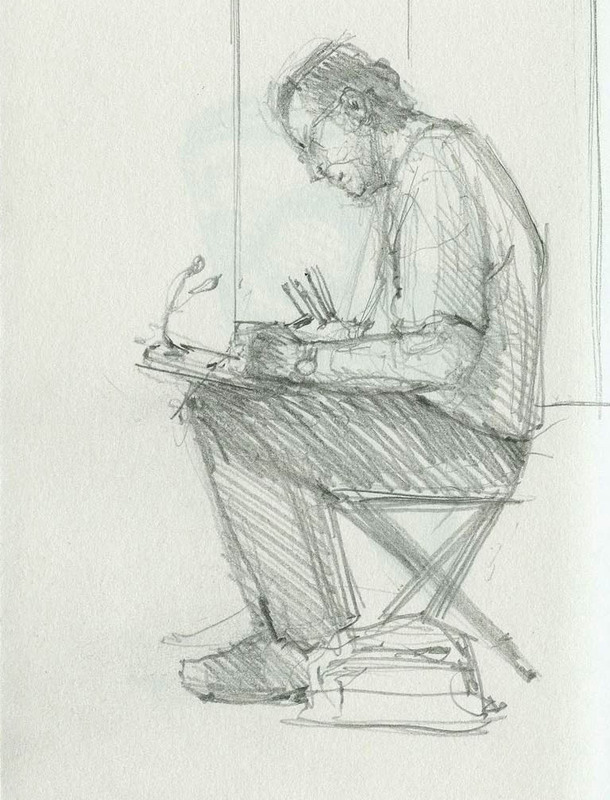 My understanding is that the hardbound sketchbooks are available in 5.5×8.5″ and 8.5×11.5″ sizes. As I was in the market for a pen-only sketchbook that I could dedicate to learning how to draw people, I bought the smaller size. I admit that I much prefer drawing buildings, cars and even fire hydrants rather than sketch people but it’s winter and there are more people indoors than there are buildings, so what’s a sketcher to do? 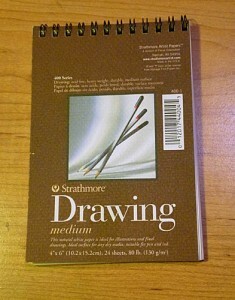 My new Strathmore sketchbook has become my “people” sketchbook. Its 128 pages of gray, 80lb paper works well with the pens I use regularly (i.e. fine nib fountain pens). I did find that if I use a medium nib and lay down a significant amount of ink there is slight feathering with my typical sketching ink (Noodler’s Lexington Gray) but it wasn’t objectionable. As I haven’t done much with the sketchbook yet I don’t have much to show in the way of examples so I’ll include the only two pages of my book that have ink on them. 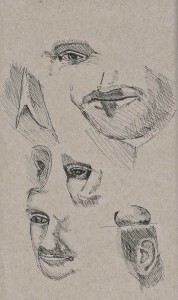 The first is a set of scribbles I did of people parts. There was no intention of anyone but me seeing this and no rhyme or reason to it so I apologize for its scattered nature. 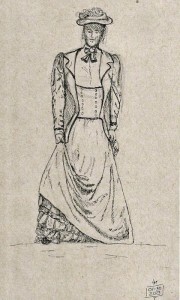 The second sketch is my first attempt at sketching clothing folds with pen and ink. Need to work on my darks a lot and proportions even more, but again, here it is. This is a post about the paper, not this sketcher’s limited abilities (grin). In any event, I hope this answers some of the questions about this paper and the new sketchbooks. Oh…I should add, this paper contains too little sizing and is too light for use as a watercolor surface in my opinion. I have done some experiments and I can get away with adding some shading using a Derwent Graphitone pencil and color with Faber-Castell watercolor pencils, moving both around with a small Sakura Koi waterbrush. 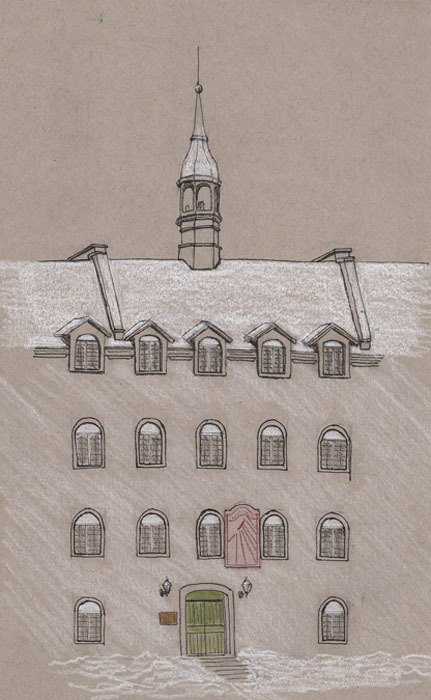 Trying to add a graded wash down the side of a building wall, however, is 1) very difficult as the paper is so absorptive and 2) the paper starts to pucker. For myself, I’ll stick to my Stillman & Birn sketchbooks for all my color work. They’re simply the best there is, though I wish I could buy them with brown covers. Do Nigerians Have Thick Necks? Goofy question, right? Well, I’m convinced there is evidence to support the notion that Nigerians have thick necks. It comes in the form of the Nigeria exhibit at our Musée de la Civilisation. That evidence comes in the form of large, and I mean large ‘crests’ worn by Nigerian dancers. 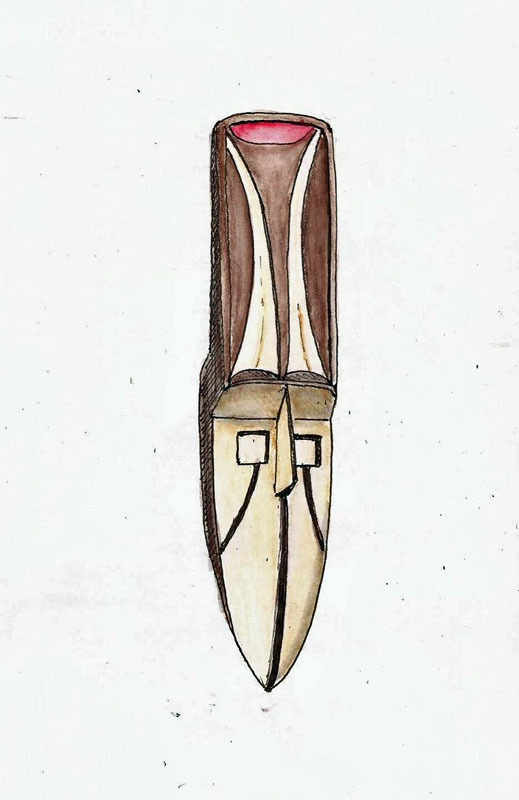 Some of these are huge and, supposedly, they wear them while doing ceremonial dances. I wouldn’t want to balance one on my head while watching TV, let alone while dancing. Here’s just one example. This ‘little’ guy is roughly half a meter tall. The straw band at its base is where your head goes. I assume there’s a strap that goes through the lower hole and runs around under the chin. Thick necks… gotta be. This next one isn’t quite as large and I’m not exactly sure how it’s even worn. It’s obviously an elephant who likes to play frisbee but other than that I know nothing about it other than that it too is labelled as a ‘crest’ and is part of a long line of them along one wall of the exhibit. 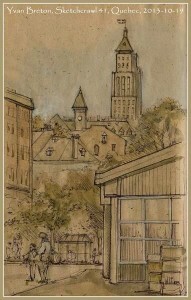 Both sketches were done in a Stillman & Birn Epsilon (5.5×8.5) sketchbook. 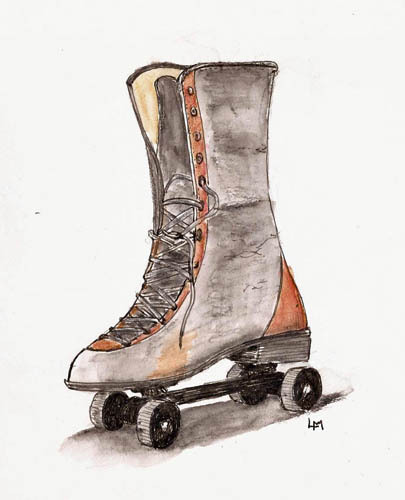 The first was drawn with a Pilot Prera, Noodler’s Lexington Gray ink and Faber-Castell watercolor pencils. The elephant sketch was done with a mechanical pencil. Thank goodness for museums when it’s cold outside.